Sault Ste. 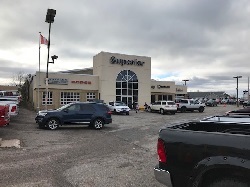 Marie, ON – Significant pension increases were a key ingredient in the ratification of a new collective agreement by members of IAM Local Lodge 2332 employed by Superior Chrysler Dodge. The bargaining unit consists of technicians, parts personnel and general labourers. The IAM represents workers at five auto dealerships in the steel city. IAM represents more than 1500 automotive workers on Vancouver Island and the lower mainland of British Columbia, in Fort Frances, Thunder Bay, Sault Ste. Marie and Toronto in Ontario as well as in New Brunswick and Newfoundland.